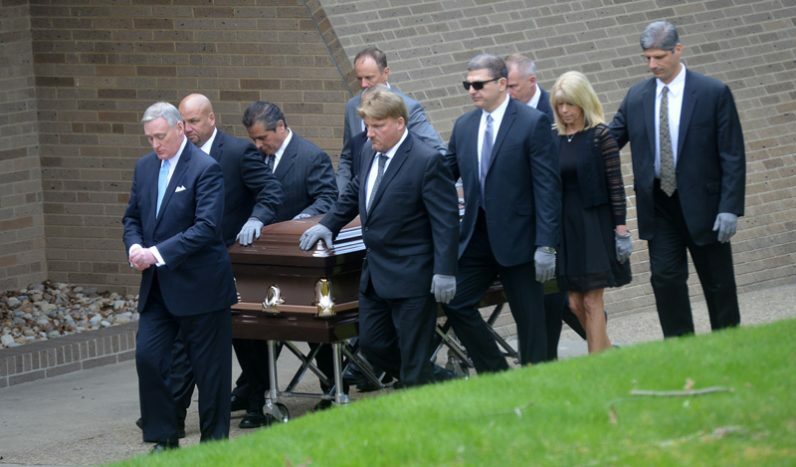 ROSS TOWNSHIP, Pa. (CNS) — Wrestling legend Bruno Sammartino was remembered as a man of “honesty and integrity” at his funeral Mass April 23. “Not only did it serve him well throughout his personal and professional life, but it is also a wonderful lesson and example that he left for all of us,” said Father John Rushofsky, pastor of St. Sebastian Parish in the Pittsburgh suburb of Ross Township. More than anything else, he said, Sammartino loved his wife, Carol, and his family. It was ironic that he was being buried on the feast of St. George, the slayer of dragons, Father Rushofsky noted. “I don’t know whether it is a coincidence or not, but Bruno certainly slayed many dragons during his lifetime,” he said. The congregation of several hundred at the Mass included Vince McMahon, chairman and CEO of World Wrestling Entertainment; his daughter, Stephanie, chief brand officer of WWE; and Dominic DiNucci, who partnered with Sammartino in the ring for many years. Among those eulogizing the legend was Dr. Frank Costa, who grew up as a fan of Sammartino and became a close friend. Costa spoke of how Sammartino’s mother, Emilia, became “the driving force in his life, inside the ring and out.” During World War II, he noted, she took young Bruno into the mountains outside of their village in Italy to hide from advancing German forces. They faced starvation after months in hiding. They were rescued by Allied troops, however, and soon immigrated to America. At the time, Costa noted, Bruno was an 84-pound weakling who didn’t speak English and was bullied in school. But through hard work and determination, he grew to become the longest-reigning World Wrestling Federation champion in history. Costa pointed out, however, that success didn’t come without pain and suffering. Sammartino survived near-paralysis from a broken neck, a broken back and numerous other broken bones. And twice he canceled plans to board airplanes that went down, killing all aboard. Sammartino’s charisma was rooted in his authenticity and his lack of contention, Costa said. The wrestler was a medical patient of his, and when Sammartino entered his waiting room, he would thrill the other patients by talking to them and signing autographs. On more than one occasion, Costa said, he called Sammartino and asked him to speak to patients who were seriously ill.
“He lifted their spirits more than any medicine could ever do,” Costa said. Sammartino never bought into his celebrity status, despite rubbing shoulders with the likes of Frank Sinatra, Dean Martin, Arnold Schwarzenegger and President Donald Trump, who once requested a private meeting with him, Costa said. Sammartino — whose bouts sold out Madison Square Garden in New York a record 187 times — would often give wrestlers on the undercard part of his earnings because he knew they were struggling. But despite it all, Costa added, Sammartino’s humility was “stunning.” He recalled the perplexed looks that he would get from the wrestler when he told him about the impact that he had on people. Sammartino stood for what was right, he said, that good could defeat evil. He also demonstrated that hard work, discipline, sacrifice and determination can overcome adversity. Costa accompanied Sammartino and his wife on a trip to his home town in Italy last August. Sammartino seemed to know his fate and was reflective, Costa said. It wasn’t until the trip that Sammartino’s journey was complete, Costa noted. He returned one last time to his birthplace as a champion in life. Larry Richert, of radio station KDKA and a friend of Sammartino, recalled how he and his brothers would rush to the television as kids when Sammartino was on. To them, he noted, Sammartino was as popular as such Pittsburgh sports figures as Roberto Clemente and Franco Harris. Sammartino once turned down a part on “The Sopranos” because he wouldn’t swear in his role, Richert said. Recalling Sammartino’s commitment to his wife and mother, Richert added, “He took the commandment ‘Honor thy father and mother’ to a new level,” adding Sammartino’s strongest muscle was his heart. Franko is a staff writer for the Pittsburgh Catholic diocesan newspaper.